Capsule Endoscopy (Pill Camera) is a non-invasive procedure that provides diagnostic imaging of parts of the bowel that cannot be reached by traditional gastroscopy or colonoscopy. Capsule Endoscopy involves swallowing a small (the size of the large vitamin pill) capsule, which contains all the necessary components (a colour camera, battery, light source and transmitter) to take large numbers of photos and transmit them to a receiver. The camera takes two pictures every second for 12 hours, transmitting images to a data recorder about the size of a portable CD player that patients wear around the waist. Common reasons for doing Capsule Endoscopy include unexplained bleeding, unexplained iron deficiency, unexplained abdominal pain, search for polyps, ulcers and tumours of small intestine and inflammatory bowel disease such as Crohn’s disease. An empty stomach allows for the best and safest examination, so you should have nothing to eat for approximately twelve hours before the examination. You can drink water only leading up to the procedure as any coloured drinks will degrade or obstruct the images being recorded. You should request specific fasting instructions from our office, which can be sent to you via email or fax. 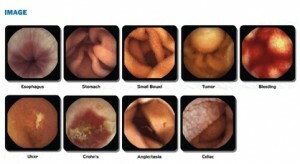 You can also download Capsule Endoscopy Instruction Sheet. You will also be asked to take small amount of a bowel prep/cleansing medicine the day prior to the examination to help improve the quality of the images taken by Capsule Endoscopy, which helps your Specialist diagnose the underlying pathology more accurately. Your doctor will prepare you for the examination by applying a light sensor strap to your abdomen with a Velcro strap. The pill-sized capsule endoscope is swallowed and passes naturally through your digestive tract while transmitting video images to a data recorder worn on your hip for approximately 10-12 hours. At the end of the 12 hours, you will need to remove the Velcro strap attached to the data recorder, and store all the equipment in a safe padded bag that your our reception staff will give to you before leaving the office. When you return the recorder the next morning to our office, the images of your small bowel can be transferred on a computer, which will then be reviewed by your Specialist. You will be required to drink a small glass of water each hour until about 6 hours after ingesting the capsule. It is important that no coloured fluids are taken during the 6 hours as this will distort the images being recorded. You will have to avoid vigorous physical activity such as running or jumping during the study. Be careful not to prematurely disconnect the system as this may result in loss of pictures being sent to your recording device. Although complications can occur, they are rare when doctors who are specially trained and experienced in this procedure perform the test. There is potential for the capsule to be stuck at a narrowed spot in the digestive tract resulting in bowel obstruction. This usually relates to a stricture (narrowing) of the digestive tract from inflammation, prior surgery, or tumour. It’s important to recognize obstruction early. Signs of obstruction include unusual bloating, abdominal pain, nausea or vomiting. You should call your doctor immediately for any such concerns. Also, if you have trouble swallowing or experience chest pain, tell your doctor immediately. To date, more than 400,000 examinations have been performed worldwide. The main risk is capsule retention, which is estimated to occur in less than 0.75% of cases. In the rare instances when this occurs, an endoscopy or an operation may be required to remove the capsule. For further advice and information, you can request an appointment, or call one of our receptionist team on .